We are back from New York, and it was wonderful. I still have more laundry and a bit of unpacking left, but we are pretty close to being settled back in at home. There was so much to do and see, but I will spare you much of the travelogue for now, and get straight to the yarn. We made it to two yarn stores, Habu Textiles, and School Products Yarn, and I was able to enhance the stash a little bit. I wish I could show you the yarns better, and even more, that you could meet them in person. As usual, most of the colors are way off in my photos. From Habu, you see (left to right) bamboo, bamboo/copper, wool/stainless steel, wool, silk/stainless steel, merino wool, bonus sample gifties (silk, mohair/silk, linen/silk), and then handspun silk at the bottom. At School Products Yarn, I picked up (from top to bottom) cashmere/mohair, silk/cashmere, and merino/cashmere/angora yarns. The blue 70% silk/ 30% cashmere yarn is four strands wound together into one cake, so I have a bit of work ahead of me to separate them into separate skeins. I do not have plans for the yarn, but am pleased with my selections. I wanted to get yarns that I do not have available locally, and I did that with all of these yarns. While I think I will knit some of these yarns into gifts for others, some of them might become lace for me. Anybody else read those Stieg Larrson books and then feel the need to knit something Swedish? The dvd collection has grown. Now I know what happened on the fourth season of Dexter just in time for the beginning of the fifth season. We do not have Showtime, so I will be out of the loop before too long. However, the other dvd set is already blowing my mind and making me excited about spinning, so I have plenty to occupy my time. Also, watching it while folding laundry makes folding laundry not so horrible. Speaking of ordinary tasks, I am spending less time doing one of them. Of course, I am talking about tying my shoelaces. Lifehacker (do not recall just how I ended up there) directed me to the Ian Knot. It will change your life. Speaking of changes, Bloglines is going bye-bye by the first of October. Have you snuggled up to Google Reader, or do you use something else? Some have suggested connecting the blog with Facebook, but that is not for me. Speaking of Facebook, I was looking at stats for the blog the other day, (I used to look at those obsessively, but not so much lately) and it seems that there has been a good bit of traffic leading people here, specifically, to the entry for the last pair of mittens that I knit. Speaking of mittens, they are one of the few things that have not been on my packing list. I want to pack light to make room for souvenirs traveling simpler and more enjoyable, but I fear being unprepared and not having something that I need. I learn a lot each time I travel about what I need to bring, and what is best left at home. I used to bring way too much knitting, but I have a better grasp on that. Speaking of travel knitting, it is time to pick some out right now. The countdown clock for our trip to NYC ticks ever closer to departure. Since I am not really sure of the schedule, I do not know what all to plan to do while we are there. It will be a short visit, so it both takes pressure off, as I know we cannot do it all, and adds pressure, knowing that our time is so limited. People have been offering their lists of must-see, must-do, and must-eat in New York, and they all sound wonderful, but I do not know if we will get to many or any of them. Still, I am open to any and all suggestions or advice on the topic. The last I heard, we will be staying at The Standard Hotel, and I am not quite sure what to think about that. If you are bored and curious, you can google about for some information on that establishment, and then perhaps understand what I mean. However, I do think it is probably a good idea that we are getting away for a few days. Last week was not our favorite. There really was not much to mention, but it was exhausting, and a temporary change of scenery might be helpful. I could also go for some different weather. It has been in the upper nineties again here along with poor air quality. The defoliant gets me, and I sure am glad they use less of it on the cotton than they did a few years ago. Well, packing time will be here before I know it, and I have not even begun to think about travel knitting, and as I try to think about it, nothing comes to mind. I may need some help. Yep, I am working with more of the Knit Picks Shadow in Hot Rod Heather. I do believe this is the last of it. It is too bad that they discontinued the colorway, as it is very nice. 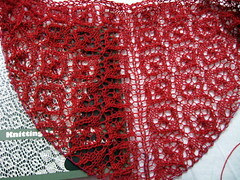 It is another gift for another friend, and the lace is flowing nicely. Working from Knitting Lace Triangles often helps to spark the delusion that I could be designing my own lace pieces, but usually some other pattern grabs my attention before I do anything about the idea. I am working this piece with the Medallion Lace chart from the book, and it has a nice rhythm. My niece, Katie, has been asking about knitting lately. Saturday evening, she wanted to give it a try. She refers to it as "practicing knitting." As with all other nieces and nephews wanting to learn to knit, she went into the adventure sure that she already knew how to do it. Perhaps it is because they have all spent hours in close proximity to my while I knit, or maybe it is just wool-fume-intoxication, but they all firmly believe that they can pick up the sticks and strings and go. Well, we kept at it long enough for her hands to get tired, and then set it aside. My hands and arms were tired, too. We tried her hands over mine, mine over hers, team knitting, and solo. I do not know if she ever completed a single stitch on her own, but the blanket we were knitting for a little toy is nearly finished. When she left that night, she looked up at me with those blue eyes and said, "Aunt Sarah, maybe if you practice knitting more, you can finish my blanket." Maybe she will keep knitting, and maybe she will just ask me to knit things for her. I just do not know. However, she did say that she would like to knit a hat for the toy, next. As I had been feeling the need for some colorwork, and Helen let me know of a need for mittens, I did not need more prodding to cast on for this pair. I chose bright colors and a fun pattern (pattern six, for those of you wondering--creative names, yes?) from Mostly Mittens by Charlene Schurch. I found my rhythm quickly and was soon through the thumb gusset on the first mitten. Then, I lost the love. I began to think that the mitten was too large. I wanted to be able to contribute, but did not want to start over. My mind began to wander, and I thought about charity knitting; the importance of quality work that meets the needs of the group receiving the knits. Then I began to think about Caps for a Cure. I have been knitting along with them for a few years, and do a little bit of moderating work on the Yahoo list. We really do have a great group. We change centers every two to three months. Each round is sponsored by a member who has personal contact with the treatment center, assuring that the caps are going where they are needed and wanted, and learning about any special requests or requirements. For example, some places love the fun fur hats and cannot get enough of them. Other centers note that caps made in the colors of local sports teams are particularly popular. 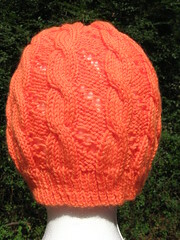 This orange Hermione Hearts Ron cap was perfect for our last round, which went to the University of Tennessee. Anyway, I knew that the mittens were nice, and I decided to keep knitting them. If they were not the right size for this donation drive, I would figure out what to do with them later. I thought about a relative who has tiny, cold hands, long winters, and could do with something bright in her life, so that was a possibility. 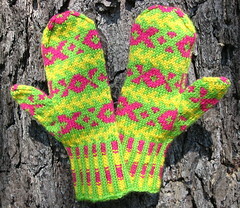 When I finished the first mitten and I still was not sure, I looked for a volunteer. I used both a niece and a nephew to check for sizing, and it turns out that I was wrong. The fit was good, so I did not delay in casting on for the second. 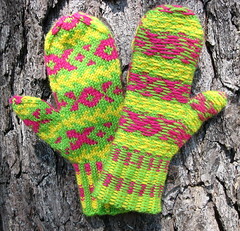 They are a cute pair of mittens, are very warm, and might be bright enough so that neither one goes missing.